The robust MikroTest coating thickness gauge, also known as a “banana gauge” is a cost effective magnetic, mechanical gauge for measuring the dry film thickness of non-magnetic coatings on steel substrates using the magnetic attraction principle. 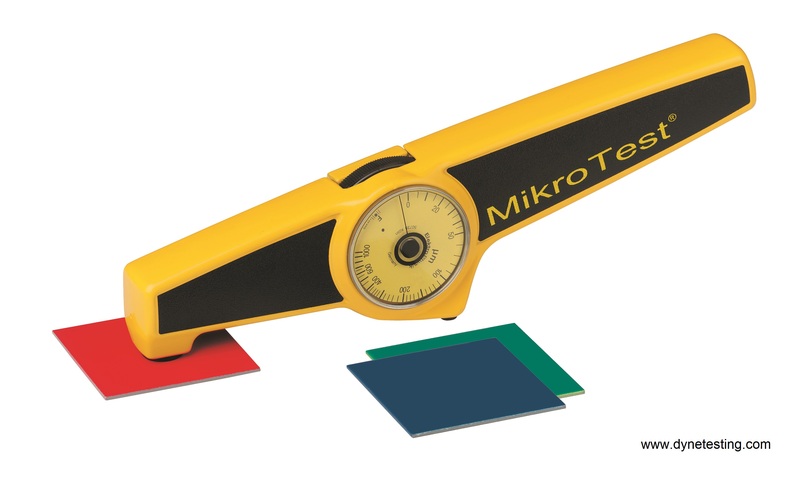 Widely used for over 40 years the instrument is suitable for measurement on flat and curved surfaces and complies with the highest technical standards including ISO 2178, ISO 2361, DIN 50982, BS 5411. This instrument is perfectly suited for electroplated nickel on copper, aluminium and other non-ferrous metals and can be used in environments where static electricity is an issue. The measuring principle is simple. The attractive force is related to the distance between a permanent magnet and a steel substrate. The distance represents the thickness of the coating to be measured. The magnet is lifted from the surface by means of a spring connected to the magnet arm. The force needed to lift the magnet is directly related to the angle of rotation of the torsion spring. Application 6 S3; 6 S5; 6 S10 Enamel, plastic, rubber on steel*. 6 NiFe50 Electroplated nickel on steel*.